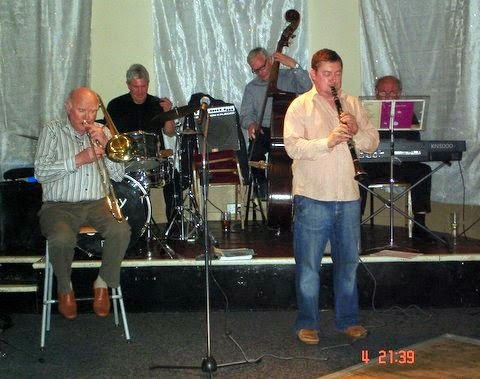 bebop spoken here: Gavin Lee's Dixieland Band @ Ashington Jazz Club June 4. Gavin Lee's Dixieland Band @ Ashington Jazz Club June 4. Gavin Lee (Clarinet), Don Fairley (Trombone), Al Langthorn (keyboard), Tom Derbyshire (D.Bass), Jimmy "Stix" Robinson (Drums). The June evening began with a dedication to the memory of Ron Pollard, a friend to many N.E. musicians and also AJC when he and his wife would visit and danced to the music they loved. He will be sadly missed by the members. Gavin's Band introduced two musicians on a first visit to our Club, Tom Derbyshire and Al Langthorn, as the group enthusiastically delivered a selection of well loved standards during two enjoyable sets. Gavin and Don form a good combination working so well together with an intuitive musical understanding while the engine room behind provided support fit for a dance floor. We do not always have a keyboard on stage but the evening was enhanced by Al. I think Mr. Tatum would have been impressed. With fine sound adjustment this proved to be a well balanced combo impeccably led. Our collective audience enjoyed every moment, even the failed jokes (sorry Gavin) and vigorously applauded a quality performance. Next Meeting at the AJC is on Wednesday, July 2. at 8.00 p.m.– Djangologie - need I say more? Not to be missed.